Wow! It has a tremendous feeling of nature clawing back! It reminded me of Ronald Wright’s book A Scientific Romance where the sub-tropical vegetation is reclaiming London and the M1. Gosh Catherine, you’ve piqued my interest – not heard of this book before, one for the list – thank you. 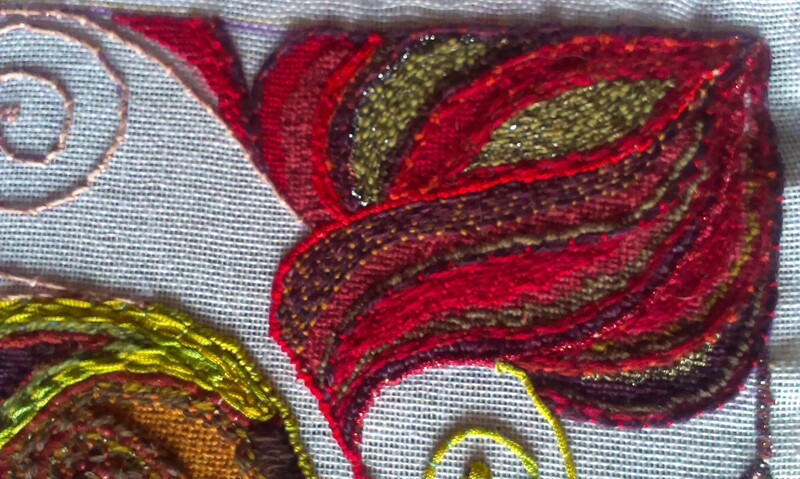 I like Jacobean Rhapsody, something of the crewelwork look in there perhaps? does it have to have a name?! Beautiful work. 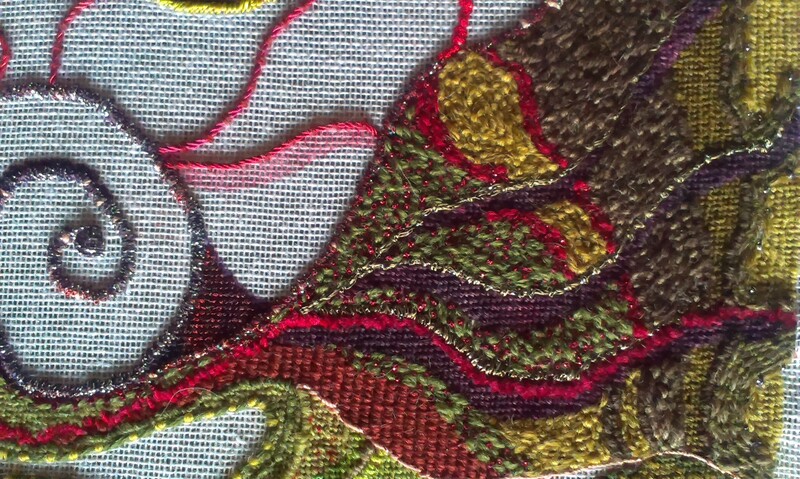 I’ve really enjoyed admiring the stitches and the colours are fab. 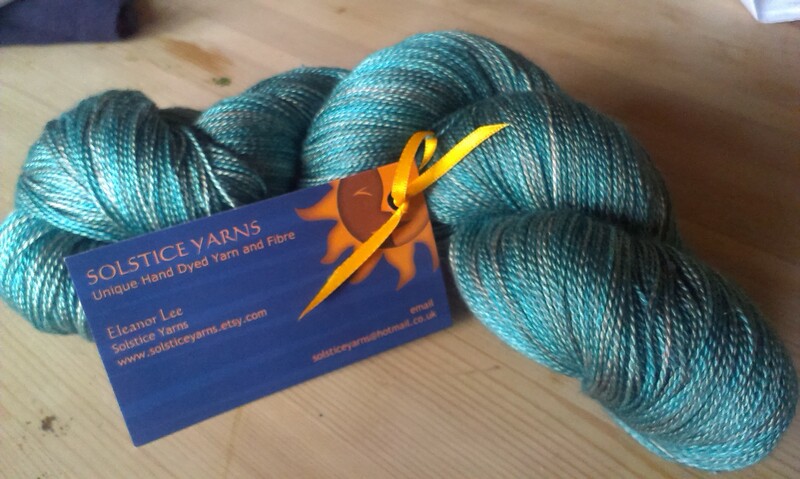 Thank you – my phone isn’t very good at close-ups and colours, this piece is quite twinkly but it doesn’t photograph. It’s been a long time since I did any proper painting, but I really love it. I’m very lucky to have the time to do it again now. Great work, both the embroidery and the painting. 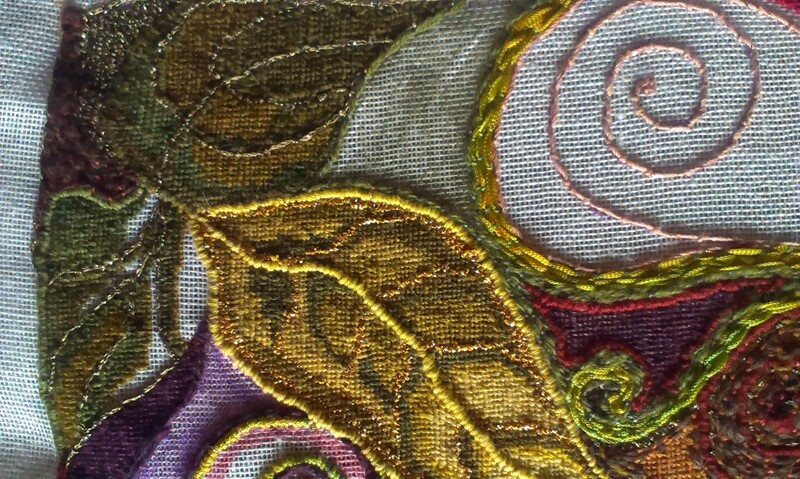 Such a variety of intricate stitching. 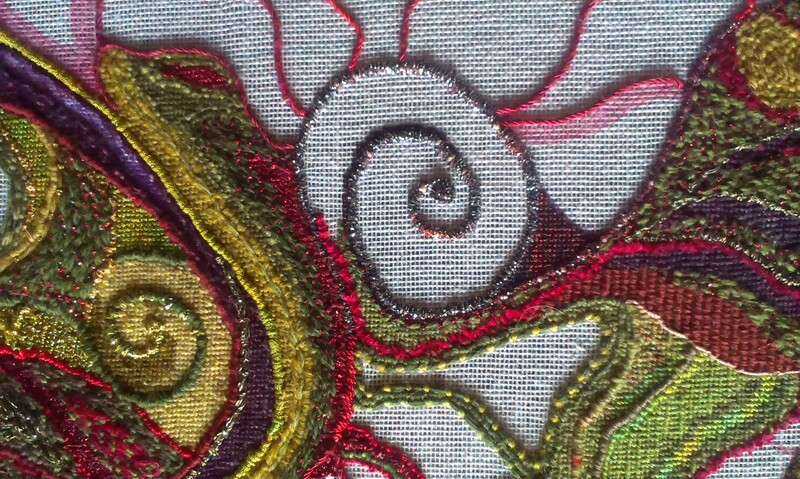 There is so much to see in the embroidery, that it is difficult to come up with just one title. Definitely flora and fauna though. Snails and a peacock stand out for me. Look forward to seeing the finished piece. It is so gorgeous I just like stroking it! 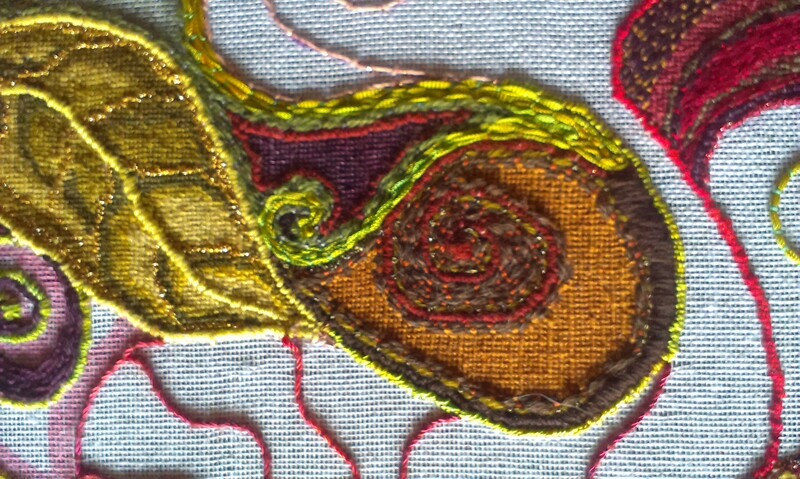 It is amazing how everyone sees something different in a piece of work isn’t it? The first word that came into my mind was ‘swirling’ and then an image of autumn leaves spiralling around on the surface of water. No ideas for a title, lovely work though – and I just dare not look at that etsy site for fear of buying! 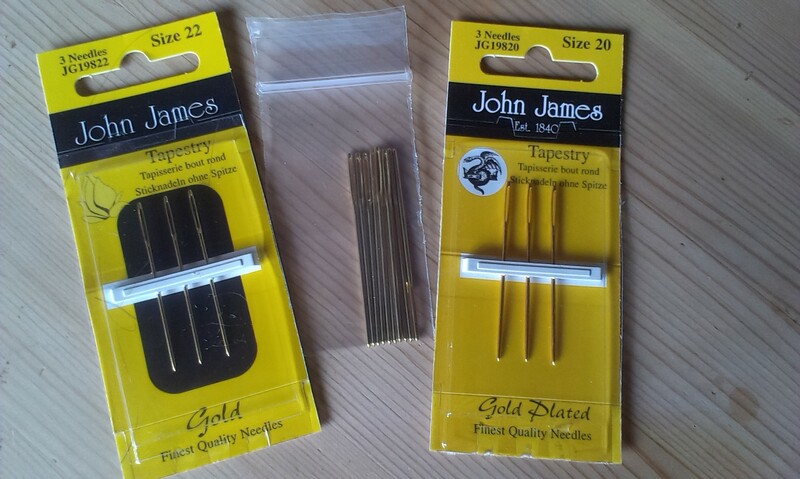 Safer to avoid the Etsy shop if your willpower is a bit below par – I have to gauge mine before I go there! 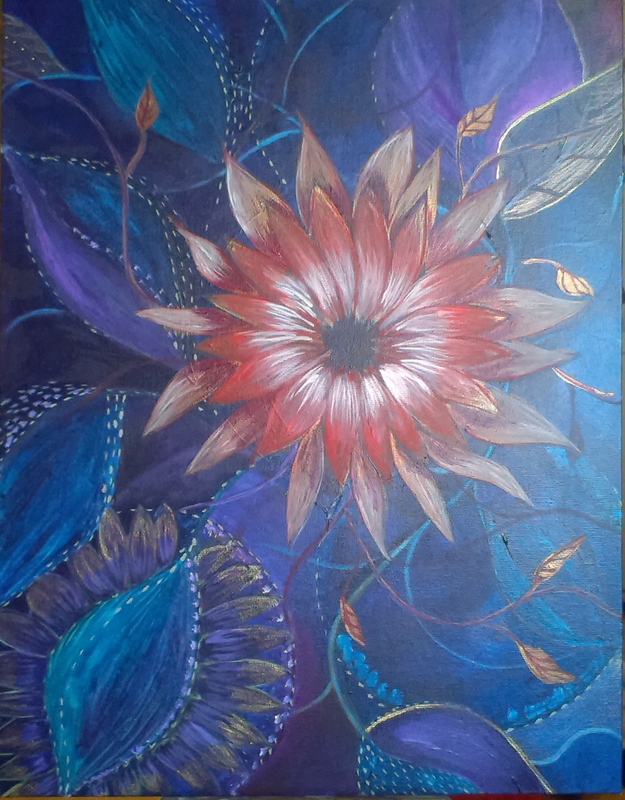 I can just feel the textures in my mind – it is a beautiful piece and stunning colours it temps me to have a go myself but I must resist – I have too many half started projects already. 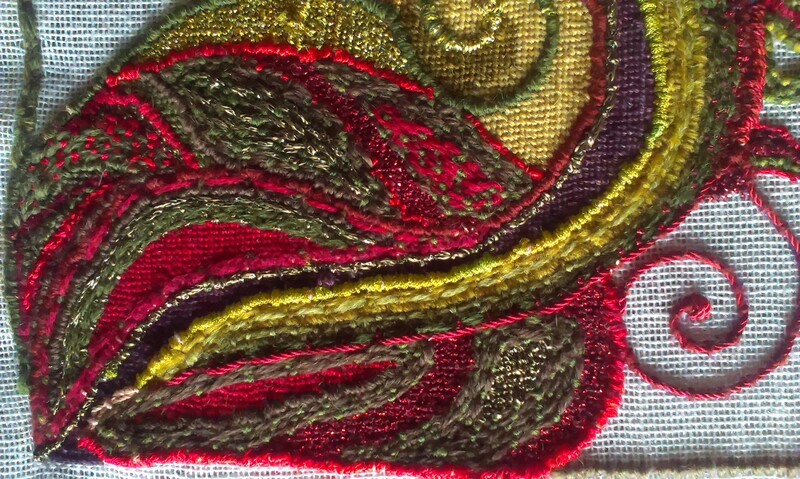 I think Exuberance because of the rich colours attributed to the Jacobean period. Glad you had a wonderful afternoon painting – lovely picture too. Thank you. Yes it’s got a lot more going on than the last one, I’ve been experimenting with adding a bit more dimension – glad that comes across. Oh thank you – I must admit that I encourage the girls to make art – it gives me a good excuse to do it too! yes, sharing art with youngsters is always a delight – you’re free to try out anything ‘cos you know they won’t be critical, just go along with the fun and see what happens – in this case something rather wonderful! I think you want a title that has something to do with Curves or Spirals… Or how about “Ramifications” – to me, a word that carries a certain sense of investigation and adventure…? Rachel hello, lovely to meet you. It’s fascinating the way certain words conjure images isn’t it, I’ve always loved ‘machinations’ it makes me think of tangled masses of threads. 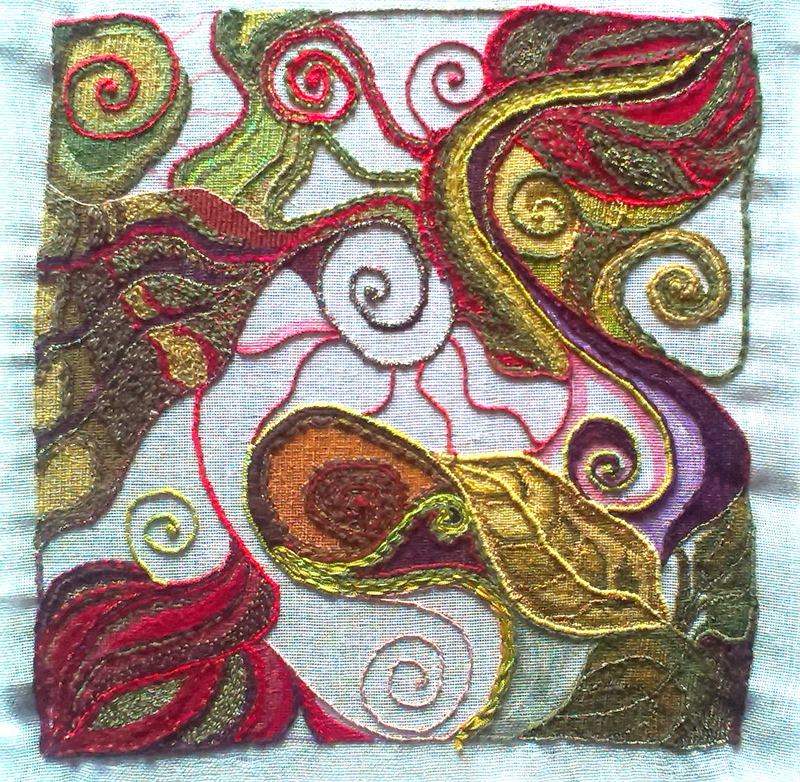 Spirals crop up in most of my artwork in some way or another – must mean something in my subconscious! Spirals have a nice rhythm to them too, which probably explains the attraction..